SUBIC BAY, Philippines - More than 700 Sailors and civilian mariners aboard the submarine tender USS Frank Cable (AS 40) arrived in the Republic of Philippines, June 7, for a port visit. 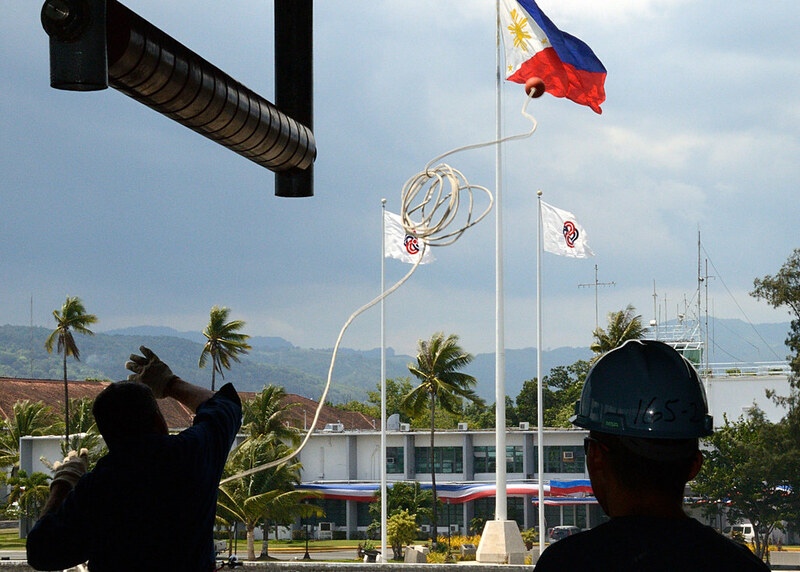 "We are here visiting Subic Bay to conduct repair work on a submarine and to expand cooperation between the Philippine and U.S. governments," said Capt. Pete Hildreth, commanding officer of Frank Cable. "We are here as guests of the Philippine government and we look forward to our time here." According to Hildreth, the ship will carry out her normal mission of submarine maintenance, as she is scheduled to receive a submarine alongside. During the visit, Frank Cable will be participating in a subject matter expert exchange between members of the Philippine and U. S. navies which allows Sailors from both navies to learn about each other's service, culture and way of life. Frank Cable Sailors will also team up with the Subic Bay police department and Philippine Army Ready Reserve to take part in several community service events throughout the area, including the Ninos Pag-asa Orphanage, Association for Differently Abled Persons in Zambales, and a local women's and youth's center. "Community service projects are done to keep a good relationship with our host nations," said Frank Cable's Chaplain, Lt. Matthew Prince. "As U.S. Sailors, we are invited guests in their country. Community service events help show our professionalism, our work ethic and that we are a global force for good." Visiting a youth center may not be what comes to mind when most people think about the mission of the Navy, but the Navy's goals are diverse. "We have a close relationship with the Republic of the Philippines. Visits such as this help further the goals of both our governments," added Hildreth. "In addition, U.S. Pacific Command has an established relationship with the armed forces of the Philippines and throughout the year, we engage in joint and bilateral exercises in the Philippines and conduct joint humanitarian projects." This visit will also allow Frank Cable Sailors to participate in a cultural class with students from Gordon College and visit the Olongapo City Museum. "Even though I know the culture in the Philippines, I like going around taking pictures, seeing the culture and eating the food," said Hospital Corpsman 2nd Class Edinmel M. Balterocruz, a Frank Cable Sailor and native of the Philippine Islands, who plans on visiting his family while the ship is in Subic Bay. Frank Cable conducts maintenance and support on submarines and surface vessels deployed in the U.S. 7th fleet area of responsibility and is currently on a schedule deployment.